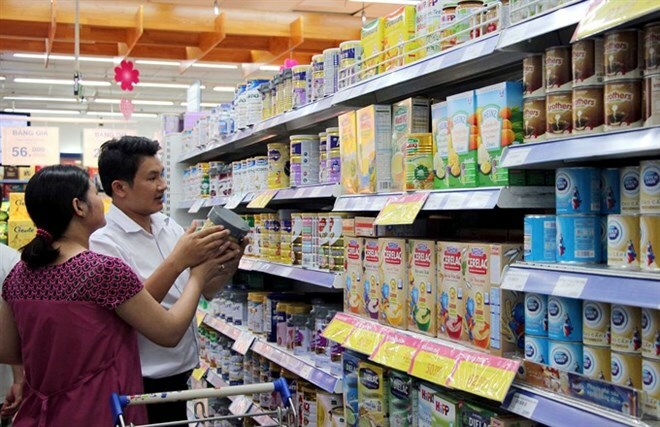 Hanoi (VNA) - Traders producing and importing milk and food supplements for children under 6 years old will be allowed to self-determine the retail prices for their products, the Ministry of Industry and Trade (MoIT) has announced. During a meeting held in Hanoi on August 2, the MoIT provided guidelines for the implementation of Circular No. 08/2017/TT-BCT on the registration and declaration of prices of milk products and food supplements for children under six years old. The circular will come into effect starting August 10. According to the Circular, producers and importers of milk products will be allowed to determine their milk product retail price. They must carry out procedures for registration of recommended retail prices with regulatory authorities during the period in which the State implements price stabilisation policies, said Deputy Director of the Ministry of Industry and Trade’s Domestic Market Department Nguyen Loc An. He added that the registered recommended retail prices will serve as the basis for State management of prices. Competent State management agencies will also supervise the registration and declaration of the prices of businesses. “Final retail prices of milk products must be listed publicly and not exceed registered recommended retail prices,” An said. Producers and importers of milk products may carry out registration of different recommended retail prices which should be suitable for each geographical region. Within 30 days as from the date of entry into force of Circular No. 08/2017/TT-BCT, producers and importers of milk products are responsible for sending the list of recommended milk products retail prices to regulatory authorities. Matthew Garland, spokesperson of the Nutritional Foods Group (NFG) under The European Chamber of Commerce (EuroCham) in Vietnam, applauded the MoIT’s issuance and development of Circular 08. Garland said the circular sets out a new direction which focuses on the management of the distribution system and the final retail prices, ensuring market transparency and consumer interests, respecting the right of businesses in prices self-determination as well as other basic principles of the market economy. According to Garland, the implementation of the circular was a necessary step toward official European Union recognition as a full market economy.